NEW ORLEANS, Oct. 26, 2018 /Christian Newswire/ -- Kick off the charitable season on #GivingTuesday, November 27, 2018, with #iGiveCatholic – a community-wide online giving event created to bring the Catholic community together to give thanks and give back. 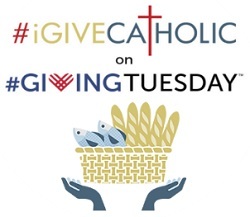 Created and launched by the Catholic Foundation of the Archdiocese of New Orleans, the fourth annual #iGiveCatholic will be held in conjunction with #GivingTuesday, a global day of giving fueled by the power of social media and collaboration. "This is an exciting opportunity for everyone to celebrate philanthropy on what is considered the most successful Catholic crowdfunding event to date," said Cory Howat, executive director for the Catholic Foundation. "We truly believe that every donation, no matter the amount, makes a difference in our community and we look forward to collectively raising millions for our participating parishes, schools, and ministries." What started as a New Orleans-based giving day has grown to yield great national impact. In 2015, #iGiveCatholic's first year, $1.36 million was raised for 112 parishes, schools and nonprofit ministries in New Orleans. Last year, $3.6 million was raised within 17 archdioceses and dioceses. Now in its fourth year, there are 29 participating dioceses, representing more than 2,500 organizations spanning from Alaska to New Jersey. "Our community will be able to support nearly 300 organizations in the Archdiocese of New Orleans that shape our souls and celebrate our Catholic heritage," said Howat. Participating organizations are encouraged to activate and customize their profile pages on www.iGiveCatholic.org by Wednesday, October 31 which is the cut-off for online registration. To see participating organizations in New Orleans, visit www.neworleans.igivecatholic.org. Those interested in donating can search the website by name or cause (arts & culture, community advocacy, education, health & wellness, etc.) This year's nationwide initiative will include 29 dioceses and archdioceses. #iGiveCatholic: The goal of #iGiveCatholic is to inspire the Catholic community to come together as faithful stewards and to "Give Catholic" on #GivingTuesday, a global day of giving back. For more information visit www.iGiveCatholic.org. The Catholic Foundation of the Archdiocese of New Orleans: Since 1976, the Catholic Foundation has been assisting the various ministries within the Archdiocese of New Orleans to ensure the financial future of parishes, schools and social and charitable programs. For more information, visit cf.arch-no.org.